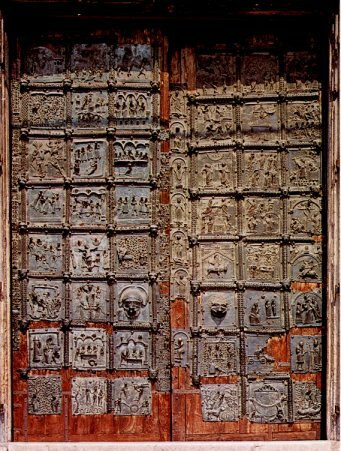 The medieval bronze doors of the Basilica of San Zeno, Verona, consist of forty-eight panels. The date of the panels is a matter of debate. It is suggested that the earliest panels date from the eleventh century and were made by masters from Hildesheim in Germany. Later panels are thought to have been made by Verona masters in the twelfth century, including the distinguished sculptor and architect Benedetto Antelami, although there is little evidence for this. These doors have been compared with the baptistery doors in Florence, but this is rather overstating the merit of them: this is medieval art, and though fascinating, is crude in comparison with that Renaissance masterpiece. As I have suggested in other postings, the obsession with attribution can become tiresome, and is a distraction from looking at the art and its theological and historical context. In this posting I'll look in detail at the content of the panels themselves. In some cases this is not entirely clear, and in one or two cases my identification differs from that made by other commentators. What becomes obvious is that there is no coherent plan for the panels. The left door mainly consists of New Testament images; the right door mainly depicts the Old Testament, but with a set of four panels illustrating miracles of San Zeno, a fourth century bishop of Verona.